Editor’s Note: Welcome to the second installment in the “DH and Listening” blog series for World Listening Month, our annual forum that prompts readers to reflect on what it means to listen. This year’s forum considers the role of “listening” in the digital humanities (DH, for short). We at Sounding Out! are stoked to hear about (and listen to) all the new projects out there that archive sound, but we wonder whether the digital humanities engage enough with the the notion of listening. After all, what’s a sound without someone to listen to it? Next week Fabiola Hanna will be reflecting upon what DH means when it talks about participatory practices. Jacqueline Wernimont from the Vibrant Lives team shared with us last week about the ethics of listening to 20th century sterilization victims’ records. Today, Emmanuelle Sonntag introduces us to a figure from a long time ago, “la soeur écoute,” a nun whose was responsible for sitting in and listening when another nun had a visitor. As she reflects on this nun’s job, she senses her notion of listening (especially in the context of the digital) change. 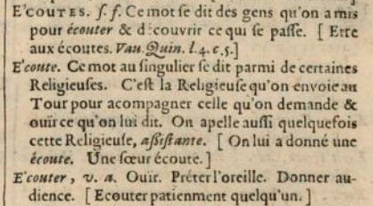 At the beginning of my doctoral research on listening, while I looked in French dictionaries for the word “écoute” I came upon, almost systematically, the expression “soeur écoute.” For example, this dictionary says “soeur écoute” is a nun who, in a monastery, accompanies in the parlor room another nun who gets visited. This is how I met this cloistered nun called “la soeur écoute” (literally, “the sister listening”, or “sister listen”, if a literal translation has any sense here). The term is “vieilli” (outdated), as written in the dictionaries, but strangely, they insist on mentioning her again and again, even in 2016 editions. She is a listener, just as you would say, “I’m a librarian”. However I prefer to say “she is listener”, without the “a”, even if it is not proper English. In French, elle est écoute, and believe me, this resonates amazingly. To me, the “soeur écoute” is a fascinating woman because her activity has ceased to exist in monasteries, allowing me to imagine her experience, behavior, life and occupation as a cloistered nun. Here she is at work. A visitor is knocking on the monastery’s door — can you hear it? The “soeur écoute” welcomes the visitor and leads him/her through the place until they reach the parlor. The room is divided in two spaces by a metal or wooden grille, the sacred one and the secular one. The “soeur écoute” has the visitor sitting in front of the grille, on the secular side of the room. On the other side, the nun who is being visited is already sitting, waiting for the “soeur écoute” to pull aside the curtain that hides the grille. The “soeur écoute” then sits next to the visited nun, slightly in the background. During the conversation, she neither speaks nor moves nor takes any notes. She just listens. When the session is finished, she closes the curtain and leads the visitor to the exit. Later, she promptly reports what she heard to the mother abbess. 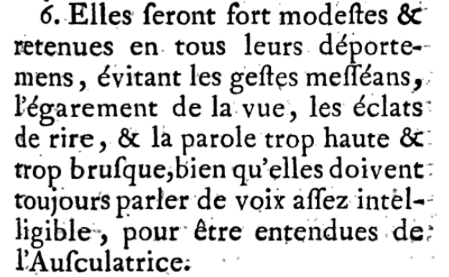 The word “écoute” has three moments in its evolution over time (of course with some overlapping). In order: someone, somewhere, something. “Someone” refers to the 12th century (“écoute,” as a person, is attested in France at the beginning of this century), and “somewhere” to the 15th (meaning the place from where you listen). Then, listening considered as “something” (the “thing” you must have to be able to hear attentively) goes back the 19th. In our common comprehension of what listening is, we are now entirely in the “something” part, with no overlapping at all. For my research, the minute I started to look at my “object” as a “person,” my thinking shifted. The “soeur écoute” rung a bell: we are in the “something” timeframe of the notion of listening, and this could blind us in our comprehension of what listening in 2016 really is. Règlemens des religieuses Ursulines, 1705, p. 95. “They will be humble and reserved in their behavior. They will avoid inappropriate gestures, as well as the distraction of sight, bursts of laughing, speaking loudly or impetuously, although they always are expected to speak in an intelligible way, so that the auscultatrice can hear them” (my translation). The term “auscultatrice” is reminiscent of the very roots of the word “écoute,” the Latin auscultare, a combination of “(…)auris, a word that gives the first part of the verb auscultare,” and “a tension, an intention and an attention, which the second part of the term marks’, as the French philosopher Jean-Luc Nancy explains. In the case of the Ursulines, it is a paradox, as the word “écoute” had been used since the 12th century, and the expression “soeur écoute” commonly used since the end of the Middle Ages. I suspect a marketing reason here: “auscultatrice” sounds much more strict and in-depth than “soeur écoute,” providing the idea of a pure and original listening, if not conservative. Second, the “soeur écoute” is part-time. A primary source dating of 1628, in a 1876 book, mentions 25 nuns interviewed about their occupations inside the Sainte-Praxède monastery. Seven among them claim to be or to have been “auscultatrice” (p. 52–54, 193, 198, 212, 234). All of them double it up with another job, such as nurse or organist. Some of them also claim being “auscultatrice de la porte” (auscultatrice of the door) or “auscultatrice du parloir” (auscultatrice in the parlor). The grille, the door and her body (when she strides along the monastery), are her work instruments, her listening prostheses. Also, the plural “ÉCOUTES“ (written in capital, as to demonstrate a precedence on the singular form) : “this word is used to designate people placed to listen and to discover what is happening” (my translation). She indeed has an ability to discover what is happening, by watching, observing, monitoring, keeping an eye, but also by aggregating the data she is collecting. The severity of their lives is striking. During the four visits permitted each year, the nuns and their loved ones are separated by a metal grille and are not supposed to reach through the bars to touch one another. Today, this order, as others, uses “extern sisters” to provide the link with the outside world. Intrigued by this grille, reminiscence of the “soeur écoute,” I watched the 8-minute demo and was stricken by two moments. The first one, at 2:20, shows Abbie Reese in the parlor, with a computer, in front of the metal grille. Behind it, one of the cloistered nuns reaches the computer through the bars in order to plug in a cable. At 07:55, this time from the point of view of the Poor Clare nuns, we see the parlor with the grille covered by a green curtain. A nun walks in, pulls aside the curtain. Then, at 08:02, from the secular side again, a nun closes the curtain while saying : “you can turn it off!”. What did we just witness? A cloistered contemplative nun reached through a metal grille to transfer some video files into a computer. It is here, around this gesture, that I see digital humanities coming into the picture along with listening. Of course I’m not building a case on the cable itself, or on the video files. It is the gesture more than anything else that draws my attention: the exact moment where the nun reaches the computer through the bars. As it comes from the outside world, by definition a visit to the monastery disturbs the extremely scheduled sequence of events and rules giving rythm to the monastery’s life. From this point of view, the “soeur écoute” is the only one, in the enclosure of the monastery, in power of keeping watch (“épier”) on what is around her. In All Ears: The Aesthetics of Espionage (English edition to be released in December 2016), Peter Szendy evokes the “écoute” (as a person) as the one whose job is to practice an auditive surveillance (“celui ou celle qui pratique la surveillance auditive”). Yet here, with this listening nun, we are reaching a listening that is much more than aural. What does she do as a job? Surveillance? Espionage? I would rather say that her listening is a lookout (“affût”), a sentinel (“sentinelle”) as well as a watch (“guet”) — I have to say here the English language lacks in qualifying precisely those notions. In this regard, Kate Lacey’s explorations around “listening in”, “listening out” and “mediated listening” is, to my understanding, an indication of the difficulty to define “the act of listening.” However, there is another aspect in which the “soeur écoute” appears as unbeatable : her ability to report. I suppose the relevance of the report depended on the visitor, so the nun had to decide whether or not to report to the abbess. All this to say that the “soeur écoute” reminds us that listening is linked to the act of reporting. 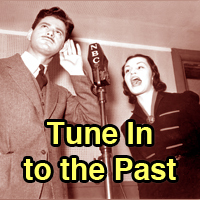 In Listen: A History of Our Ears, Peter Szendy underlines listening as being not at all benevolent, the kindly meaning being a very late one in the long evolution of the notion. Quite the contrary, argues the French philosopher and musicologist, listening holds a great amount of perversity. When observing the “soeur écoute”, this is what we see: a woman whose listening is not kind. Let us revisit the video at 02:20: observing, again and again, the gesture of the nun with the camera cable. Her body and the grille. Her face and attitude. What she says. How she tries to plug the cable. Her hands and arms. Her fingers. Her way to deal with the grille. The nun is in movement between (and with) those technological objects, digitally ensuring the mediation between both worlds. In Listen, Szendy argues (in an ironic passage of the book, hence difficult to quote) that listening is “a matter of touching.” He stands up for “listening with our fingertips” (in the French edition, slightly different: “l’écoute au bout des doigts”). While doing so, Szendy plays wonderfully with the word “digital.” In French it has two meanings : “digital” refers to the fingers, but also to the digital, like the one of the digital technologies (although more often translated as “numérique”). The “digital” intervention of “sister listener” then takes a new dimension, between fingers and technology. In All Ears, Szendy highlights listening as a kind of intelligence activity, “activité de renseignement” in French. Yet, “renseignement” also means filling in a metadata, or, if you prefer, a field that describes a digital object. Like the nun trying to plug in the cable. The “soeur écoute” then appears as a figure of a “filling in” processes and practices : while listening, she also informs, and in-forms. I just read the fascinating story around a visit in a cloistered monastery close to my home in Montréal. Again a grille. Again a green curtain. This time though, the nuns reach easily through the bars, shaking hands. Nuns have the internet. They know how to catch the rumor of the world, if they wish to. My partner told me recently: “it seems you are building a case on someone whose job does not exist anymore to reflect on something very contemporary, the digital.” Yes, it is exactly that. This is what is so liberating with the “soeur écoute.” And no, it is not exactly that, my dear: I’m not sure she does not exist anymore. What if a little bit of a “soeur écoute” would be in all of us? In other other words, what if the way she listens would inform how we listen today, making the connection between listening as person (the “someone”), listening as place (the “somewhere”), and listening as object (the “something”)? 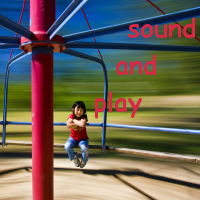 I see the “soeur écoute” as a reading grid, or framework, which forces to rethink listening and its role. Reaching through the bars, she helps expand the study of listening beyond its sonorous contours. She encourages to consider listening in order to include the non-sonorous aspects of “keeping watch” and “sentineling”. Going from one world to another, from one side to another, pulling aside curtains, she urges us, “researchers of listening”, being “tierce” and part-time in our methods and attitudes. 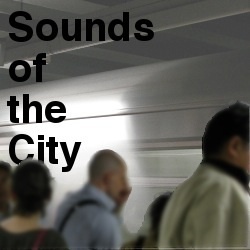 Even if it has to go such as far as considering listening as a counterpoint to sound. After all this, maybe, starting to auscultate the relationship between listening and digital humanities. I have to go. I have put Listening under custody. I have a cable to plug, and a report to write. Emmanuelle Sonntag defines herself as a “knowledge organizer.” She offers consultancy services in communication, education, curriculum design, information management and knowledge mobilization while pursuing her PhD in Sociology on… Listening at Université du Québec à Montréal. She tweets on listening, sounds, stories and other noises @lvrdg.